This is the BETA release for Linux Mint 17.3 “Rosa” MATE Edition. Will give the 64-bit version a try. What an Excellent WIndow Manager it is!! Compiz, Compton, Marco with all those brillaiant combinations!! I think this is the very best release since LM 10 with old Gnome 2.4! Everybody, who was a fan of old Gnome 2.4 must try this! Thanks Clem, Monsta and all the team! On my Intel based laptop w/ SynPS/2 Synaptics TouchPad I’m finding an issue with the ‘Mouse Preferences|Touchpad’ settings, specifically the _new_ ‘Two-finger/Three-finger click emulation’ drop down boxes. Setting either or both ‘Two/Three-finger…’ to ‘Disable’ changes NOTHING. I.e., set to ‘Disable’ two-finger clicking still yields a context menu, three-finger clicks input highlighted text at the cursor’s position as before. Switching settings to ‘Left/Middle/Right’ also does NOTHING to change Two or Three Finger clicking behavior. I noticed this when I did the MATE 1.12 upgrade in LM 17.2 (Nov 6 Segfault post). Just checked to see if this was still an issue running LM 17.3 Beta LiveCD. Yup, no diff. This issue still exists in Beta for me as well. Edit by Clem: I’m sorry I can’t reproduce the issue. I’m testing it on two separate computers (a macbook and an Asus laptop) and both work fine here. I can disable these features, change their behavior… everything is working as expected. One thing that still could be better are the screen-savers, they where better (more alternatives) a couple of years ago. Why not introduce “floating LM-logos”! Can’t wait to download n install the final rel. “The 64-bit ISO is recommend for all modern computers…” Does that include even low RAM computers, say 1GB or 1.5GB? Come to think of it, perhaps those would not be classified as “modern”! I am now on tenderhooks. Wish I had the time to help in Beta testing. So I will sit here now and TRY to be patient. This is cool. Will be testing on a Lenovo G30-50. Had some minor problems on 17.2 however a kernel update seems to fix most of them. Just one thing, how come you guys build on an an older kernel? May thanks to clem and the mint team. Edit by Clem: It’s mentioned in the new features page, in Trusty kernel 4.2.0 breaks ATI and Broadcom drivers, so it wasn’t an option. i may be blind. but how to upgrade from 17.2 to 17.3? Edit by Clem: The upgrade path will open after the stable release. Guys, this is the smoothest and most responsive update I have had since Linux Mint started using Mate! So far after two days of comprehensive use and I really have tried to pick fault, I can find no problems or niggles. Congratulations to everyone concerned. In times past, didnt we call an initial release a RC (release candidate)? Is there are difference between Beta and RC for Linux Mint? Edit by Clem: No, and you’re right, this is actually an RC.. we don’t do BETA/ALPHA releases. At the cost of making it sound less stable than it actually is though, we decided to call our RCs “BETA” from now on because it’s a term most people understand, as opposed to RC which raised a lot of questions. The default video player (totem?) doesn’t work with mp4 files (h264 encoding). I had the same problem with 17.2 as well; never did solve it. vlc has no problems. I use gnome-subtitles extensively and it too couldn’t open the same mp4 file. Edit by Clem: It must be the sound track or something? I can play many different H.264 / AVC videos in MP4 container here. Its slow because of a single core cpu but ,… it WORKS ! Linux mint Rosa 17.3 tested with the Silentburner approved seal ! Clem is there a way to upgrade to the beta from my current 7.2 stable? Edit by Clem: It’s possible with apt-get. We do however recommend people wait for the stable release, at which stage the Update Manager will allow a graphical upgrade. Edit by Clem: Of course, but it’s not comparable. 14.04 is almost 2 years old so many bugs were identified and fixed. 15.10 is much more recent and it uses a much more recent stack of upstream software (which itself brings new bugs). It’s not comparable also because 15.10 is an intermediary release, so it’s only meant to work for 9 months, repositories can be retired any time after that. That said, it’s a bit unfair to call 14.04 “old” or to call 15.10 “unstable”, they’re very different in nature, one is LTS and the other is not, they’re aimed at very different audiences. who wants can install and try the new beta over the stable with no problem. systemback or time shift can restore the stable system anytime and very easy in some minutes. Is there any chance https://github.com/linuxmint/mintmenu/issues/87 will be looked at before the stable release comes out? I’d really love to use a dark theme with MATE, but then I won’t be able to use the Mint Menu since the text becomes unreadable. Either way, I’m really looking forward to the next release, thank you for all the hard work! During installation, transaltion file for ubiquity slide show the name slideshow-mint doesn’t seem to work. all the process shows English only. Edit by Clem: Yes but the slideshow is localized right? Its translations files are already installed.. they’re in mint-translations. Last night I installed the Mate version and afterwards installed Nvidia 352 recommended. But upon reboot, all I got was a blank screen with a blinking cursor. Well, undaunted, I reboot and chose the recovery options. There was a button to (I think) search for missing files or something. Anyways when clicked it downloaded a file and after rebooting everything was fine since then.. I have the Nvidia G640 card. ou really do put the FUN back into computers. Thanks! Open caja at a folder with several folders and files inside. Switch from Icon View to List View, using the control in the tool-bar. Click on the Parent Folder button in the tool-bar. On second time of trying, the folder labels (except the one selected) all go nearly invisible. This does not look right. It does it on Mint, Debian, Ubuntu MATE and PCLinuxOS. It does it in MATE 1.8, 1.10 and still in 1.12. One computer is an old Mesh 64 3000 (using nouveau driver). One computer is a newish DELL Inspiron (using NVIDIA proprietary driver). It does it with Mint-X, Menta, and other icon themes. I’m using Traditional Green Theme with compositing. I too have noticed this bug. Opening new tabs triggers it as well. Occurs with all my themes and Mint X. Only distro Ive come across that does not contain it was Mint 13 Maya, which used MATE 1.2 or so. I have found a workaround though: Change the background color within Caja to another color. I use the mixer to make a very close scheme to white. Just play around with it for a bit until something works. Am now able now set different icon views for different folders without the font regression. However, going from a folder with list view directly to the filesytem directory with standard icons still produces the problem. Elsewhere not an issue from what I can see. Very unusual. Hope to see this fixed myself. Caja is my favorite file manager. Awesome release otherwise. The implementation of Compton is great. I really don’t know what I’m doing wrong? I’ve know checked on a Netbook I own w/ LM 17.2 MATE 1.12, but with ‘Clickpad’ type hardware and it exhibits the same behavior, i.e., changing the ‘Two-finger/Three-finger click emulation’ does not change finger click behavior for me on that machine either. Edit by Clem: Oh… you’re talking about taps, not clicks! I can reproduce your issue with taps alright. I had that disabled, that’s why I didn’t notice it. These are different settings, and they don’t appear in the preferences. You can however set them with gsettings (they’re in org.mate.peripherals-touchpad, tap-button-two-finger, tap-button-three-finger). They’re even hardcoded in Cinnamon. We’ll improve that in MATE 1.14 and Cinnamon 3.0. Just installed 17.3 in VirtualBox and noticed that the System Monitor is unresponsive at times, crashes, requires force quits, and only shows the icon of the process name instead of the letters unless the window for the System Monitor is fully maximized. Great team work, but I am still using stable LM 13 version. Is it possible to add to LM 17.3 Mate DVD release some programs (these are very little programs and easy to fit to package) ? – Firewall (like both Gufw and Firestarter, because so many disturbers/ hackers in networks). – Virus- scanner (like ClamTk, because so many viruses in networks). – Hard Disk Tool (working like in LM 13). Edit by Clem: gnome-disks is here, gufw and clamtk are too niche though, very few people protect their Windows network from a Linux box and most ISPs place their customers behind provided NAT/Firewall routers these days. Continue from the Reply #22 about slideshow translation. Yes, it has been translated already. I would check it out more of it. it starts with English to the end…. Can you check it out please, Clem? Edit by Clem: OK, I can see what’s wrong. We’ll have that fixed. I’m presently using Mint Mate 17.2 without any issues. Edit by Clem: Make sure to check the MD5 sum of the ISO, burn at the lowest speed, perform an integrity check and try the compatibility mode. That update sounds great, as usually do! Just one question Clem: When upgrading from 17.2 to the stable 17.3, will it double certain Mate apps as it did in the past from 17.1 to 17.2? (ex: two calculators, etc) or that issue has been solved? Edit by clem: That was specific to the MATE 1.8 -> MATE 1.10 upgrade and it was because some of the MATE 1.8 apps you were using no longer existed in MATE 1.10. It won’t be an issue this time around. will we see openbox option in the windows manager on the stable release of LM 17.3 mate? Edit by Clem: We could install it by default, I’m not sure there’s a need for it though.. I have a TV connected via a HDMI cable and cannot set “Same image in all monitors” in Displays / Monitor preferences. The Monitor preferences window just closes. I tried LM 17.3 Mate x64 on lenovo g50-30 with Intel graphics. Edit by Clem: If it crashes, please provide a stack trace. Thanks Clem. I re-burnt the DVD and now I could run it live. It looks great and I love to see updated applications. Though, for the last few Mint versions (maybe since the use à Caja? ), I find it annoying that the bookmarks with put in the side panel of Caja don’t show up the application file dialogs (ie. when opening a file). Formerly, that left panel (with places and bookmarks) used to be identical. That was useful and much more convenient. Now we have to add it to Caja and also to the file dialog in an application. Could you bring it back to the previous behaviour? Edit by Clem: The file dialogs are handled by GTK unfortunately. However I wonder over one thing, the Mint logo doesn’t show up during startup as it use to, only some dots lights up one by one. Should it really be in that way? Edit by Clem: It’s not necessarily an issue, it depends on your GPU/drivers. 1- The “Alert Volume” slider does not keep track of the set volume (it always defaults to zero (all the way to the left) although the sound does play at the set volume. 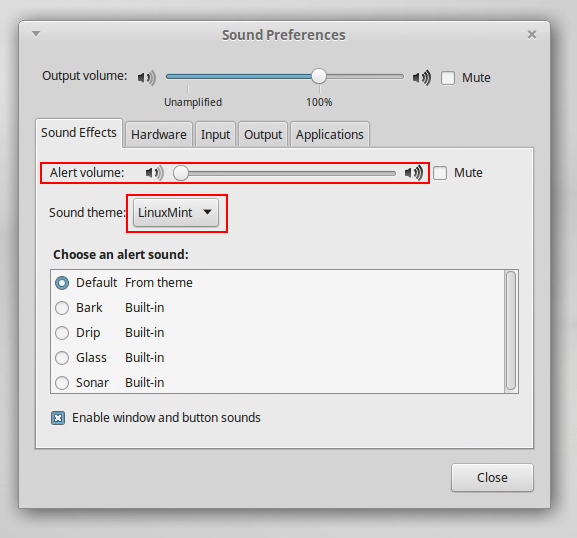 2- The Sound theme is randomly switched to “No sound” after clicking different alert sounds. Eventually it sticks but has to be set at least 2-3 times before it finally gets it. Not sure how else to report this, it is inconsistent… try it and you should experience the same issue. I’ve replicated in 2 completely different installs (laptop and VM). Edit by Clem: Hi Ralphy, this doesn’t just look broken to me, it looks wrong from a design perspective. Sound themes were removed in Cinnamon and replaced with sound events. I led that implementation for Cinnamon and I could do the same for MATE in the next release. I’ll add it to our roadmap and we’ll discuss this with the MATE team in preparation for 1.14. Do you guys get this issue? If you have a github account, please add your comments (and steps to reproduce) there. In next version, would it be possible to add JITSI, Clementine, Musescore, PDF Mod, Tomahawk, Midnight Commander, NTP ? I have a pretty straightforward setup, but 17.3 beta works great here. I have chosen Marco+Compton as the WM. ISO uses Memtest86+ version 4.20, it itsn’t the last version. Edit by Clem: The only impact they have until you actually run them is taking HDD space. Solution to fix this is disconnect external monitor (D-sub VGA) and connect again. Edit by Clem: Hi, please provide a stack trace for bug #3 (also check package updates for mate-control-center, a similar issue was fixed). I tried to change the admin password in “System – Administration – Users and groups” menu, after installation. It works with a complicated new password but if I choose a new simple password (only 5 letter by exemple), the password isn’t changed, the window stays grey and nothing happens. #44 @Monsta, updates now enable “same image in all monitors”, which defaults to the lowest common resolution of both screens (640 x 480) and higher resolution cannot be set. Regards to the LM team. Finally Compton solved the very annoying screen tearing problem when watching videos. Thanks! I installed kdenlive. It’s strange, menus are replaced by “No text”. Seems to be a KDE bug ? Physical volume buttons do control the volume, but nothing indicates this on the screen. In 17.2, a small volume window would show a bar moving left or right for increase or decrease in volume but 17.3 does not. Also, the volume icon on the panel next to the time/date would respond in 17.2 but it does not 17.3. In 17.1, VLC Media Player worked fine. In 17.2 and 17.3 when playing a video file maximize, the Playback Controls becomes unresponsive. It will still play/pause and/or skipping to a specific time, but it does not reflect this on the screen unless VLC window is restored and then maximized. Just noticed that when I open Mint Menu (programs), its title says “mintMenu.py”. Edit by Clem: I can’t reproduce this.. which WM are you using and how do you start mintMenu exactly? Ok, so I totally confused ‘clicks’ with ‘taps’. Yes, I thought the ‘Two/Three-finger click emulation:’ options where referring to what would occur when doing two/three finger TAPS! Sorry. Edit by Clem: That’s alright, it is confusing and it shouldn’t work the way it does. I added it to our roadmap so we’ll fix that both in Cinnamon 3.0 and MATE 1.14.
could you please tell me if with 17.3 I will have yet problem to start my desktop with live Mint system on MSI motherboard A88XM-E45 and AMD A8 -6600K APU Radeon HD8570D? The system will start again to restart continuously, without give me the possibility to install the SO and install the correct video driver? 1) What is the CORRECT procedure to start the Live System with this hardware? 3) OR there is a kernel version that solve the issue? So I can install this kernel on other PC and make an Systemback ISO with proper kernel?? Edit by Clem: The best thing to do is to give it a try. I’d suggest to try the normal mode first, and failing that the compatibility mode. Then post-install -> Advanced Options -> Recovery Mode -> Resume. And then install fglrx from the Driver Manager. The kernel in 17.3 is 3.19. Note that kernel 4.2.0 is in the repositories but at the moment it doesn’t work with fglrx. As an LMDE junkie, when can we expect these updates pushed out to LMDE 2? Thanks for making the best OS in the world EVEN BETTER! Edit by Clem: Most of them are already there Rhy. The missing ones are already built for LMDE but they’re held either because they require testing (that’s the case for mintdesktop for instance) or simply because they got upgraded following BETA feedback (in which case you’ll probably see them in LMDE around the time of the stable Mint release). In Caja 1.12.0 during copy and paste operations ‘past into folder’ appears to be the only option in the right click drop down menu. If the cursor is pointing to a single file within a folder, ‘Documents’ for instance, the drop down menu has no paste option, however the keys control+v will correctly paste the copied file into the folder? Right clicking on the Document folder in the tool bar at the top gives you the option ‘paste into folder’ which paste’s the copied file into the folder as expected. The menu bar at the very top also works as expected and the drop down menu has a ‘paste’ option which again will past the copied file into the folder. I’m lost with Github, where must I write issues for MATE ? A lot of my issues are closed because they are always in the wrong place and people who close them never say where to make a report. I’m loosing my time to make reports that will not be used. Or here : https://github.com/perberos/Mate-Desktop-Environment ? In fact, it’s difficult to find the good place, mainly in https://github.com/mate-desktop and its sub-directories. I prefer having only one place, adding keywords, with a team of people who read and choose who will work on the issue, like with Bugzilla. Edit by Clem: Hi. Sorry, I understand it’s confusing. You’re not wasting your time though, even if no action is done as a result, feedback plays a role always. Perberos is no longer active. github.com/linuxmint is Mint’s collection of repositories, but MATE is an independent project, even if half its team is currently made of Mint devs. github.com/linuxmint/mate is Mint’s MATE packaging and building tools. MATE itself is at github.com/mate-desktop. Looking at the issues you created, they’re related to a Mint specific tool called mintdesktop (Desktop Settings), so the best place for them is github.com/linuxmint/mintdesktop. I get your point and agree that we’re looking at duplication here and maybe some of these options should be removed in mintdesktop now that they were added to MATE itself. In the case of the user settings, be aware that one is targeted at the user and allows him/her to change his/her own account details, while the other tool is aimed at sysadmin.. so that’s quite different and it’s normal to see duplication here. Unfortunately this 32bit version inherited yet another setback from Ubuntu 15.10, which wasn’t yet present in the Alpha from Jun, 25th, causing it to lose touch with its PATA boot DVD drive on a nVidia nForce2 Ultra 400 based Athlon XP mobo. XUbuntu 14.04.3 i386 Beta from Aug,5th and Ubuntu Mate 15.04 i386 Vivid from Apr 22nd don’t exhibit this problem. And then there is of course still the 100% CPU load problem, occurring with the required radeon.modeset=0 kernel setting with older Radeon AGP GPUs (R420, RV350, RS100), which was introduced after LM11 x86 and never been fixed since. Edit by Clem: Please link us to upstream bug reports, known solutions for these two issues if possible. Finished to install and test this bêta. Linux Mint is a wonderful OS and is better at each version ! What a good work ! mint17.3 is great and I love it so much,thanks a lot. I removed java with command”sudo apt-get remove java*”,then installed a new one with enviroment setted, but I don’t know how it does’t work anymore. I can choose the system and it did start, but only command line works, I can’t start window desktop anyomore. I am a new comer to linux.I don’t konw wether I am the only who face the problem. Edit by Clem: Hi Bruce, try to isolate the issue. Did you try nvidia-346? Thanks for this great 17.3 MATE 64bit Beta (release candidate). The continuous quality progress is fantastic! So far, am testing in VirtualBox and on a Lenovo T61 laptop. Will be testing on a netbook and desktop soon. Have noticed that the HELP link to the Yelp verion of the User Guide is no longer on the Welcome screen. When it appeared with LM 17.2, I was really glad because some of the Linux new newcomers at our LUG don’t have Internet at home to download a newuser guide from the webpage. Edit by Clem: It can still be accessed offline via Menu->Help. @68 – Hi Bruce, I had a similar problem and ran the 17.3 Beta from RECOVERY MODE, it will fix it if you choose the option to download missing file (or something like that) it worked for me on two different OS, both Mate & Cinnamon. I have Nvidia G640. And I used 352 Recommended. Bruce it was “repair broken package” which fixed the problem for me. Edit by Clem: Did you spot which package was broken? and which file was downloaded? Thank you Bill, I will try that. I tried the 340 driver as well, same thing. I wonder what is getting broken? I wanted to ask the Mate Developers if there are plans for “Align to Grid” for the desktop icons. For me its very annoying that the icons don’t align vertically and its been like that for a long time now. I really love the Mate DE and the icon alignment is the only problem i have with it. @71 Clem, Sorry, no I did not. It went by really fast and it was a small one only 378k or something and I didn’t expect it to work, but I’ve done it twice now with Mate & Cinnamon and it worked both times. If I can get time over the next few days, I’ll do a new install on another partition and see what happens. I’ve been real busy with wife having had surgery so I make no guarantees. Thanks though for caring. Okay Clem I got it!!! I installed a new version of Mint Mate 64 bit to a brand new partition. As soon as I updated the driver to the Nvidia 352-recoomended it would no longer boot into the system. So that’s 3 out of 3 times using my nvidia GeForce GT 640 2048MB GDDR3. 6 packages were downloaded: grub-common grub-pc grub-pc-bin grub-pc-common linux-firmware linux-libc-dev, totaling 329k requiring some small additional space on my HD. Kinda weird but it fixed it! Hope that helps, it’s 1:00 am and I’m hitting the hay. Night now. PS, I forgot to tell you that after installation I got all the updates via update manager BEFORE I downloaded the nvidia 352-recommended driver and then tried to reboot but couldn’t until I ran recovery mode. Okay that’s all. Edit by Clem: There’s a grub update in there… can you try installing 17.3 again, NOT perform updates, and simply install nvidia-352 from the Driver Manager to see if that works? So we can isolate either nvidia or the grub updates as the cause of the problem. Edit #2 by Clem: By the way.. linux-firmware and linux-libc-dev are level 5 updates… did you install these manually prior to installing nvidia-352 and without a reboot in between? I did the same thing in regard to updating completely afer a new install and then installing the 352 Nvidia driver. And I couldn’t boot afterward as reported before. I tried installation/update/nvidia driver install again and then tred to boot into recovery (hold shift on post, correct?) but recovery mode would not come up. Ugh.. It can be reproduced even in LiveCD, without installing Linux Mint. Starting with mintsystem 8.1.5, the APT priority for Linux Mint repositories is lowered to 500 (with the exception of the upstream component which stays at 700). This facilitates the addition of PPAs and also makes it easier for Mint to backport packages. If you modified APT priorities before (for instance, if you elevated a PPA priority to 700), please revert your changes (i.e. that PPA no longer needs a high priority). Another note: Broadcom STA drivers (bcmwl-kernel-source) now work with Kernel 4.2.0. Thank you, apt install kdelibs-bin kdelibs5-data kdelibs5-plugins helps, krita works now. 1) Users don’t care. For regular user Krita just does not work, but in Ubuntu 15.10 it does without any additional commands. 2) Those packages can be dependencies of krita. Maybe it’s not possible for some reason – then I’m sorry. All right..I installed Mint Mate 64 bit to a new partition. I booted into the new OS and installed the Nvidia 352-recommended driver AND THAT”S ALL I DID. Then I tried to reboot, but no luck, just a flashing cursor on a black screen. So..I went into advanced options and rebooted into RECOVERY MODE. I ran “repair packages,” and there was the update I guess because there were 96.1 megs of archives to download and install. (Everything from caja, marco, openjdk, mate-desktop and all the grub stuff like grub-common, etc. After the install of the 96.1 megs which automatically updated grub, I was able to reboot into the OS just fine and I’m typing this right now from there. No I did not, and btw, those level 5 updates linux-firmware etc, were automatically installed in the 96.1 megs. I just wanted to add a quick note that the SAME thing regaridng the Nvidia driver and not being able to reboot back into the OS is happening in another distro (LXLE 14.04.3) as well. Just gives an indication that it is not just Mint specific. Just a heads up that maybe it is affecting all buntu’s with current updates. Friends Linux Mint excellent distribution … waiting Rosa, will you fix the problem with Nvidia cards oldest fails with some graphics Mint 17- 17.1-17.2, which in Ubuntu or Linux Mint 13 does not happen! … That day Ships? … Thank you for the great work! I have run into a problem that matters and existed in LM 13 but was fixed beyond that up through LM 17.2. The problem has returned in LM 17.3. I have lucks/cryptsetup full disk encryption. I have a wireless Logitech K520 keyboard and unified USB receiver. I can use the keyboard at the grub screen but when I advance on to the password screen to open the drive the keyboard doesn’t work. I have to use a usb keyboard for that password screen. The wireless keyboard works for absolutely everything except that password screen. In LM 13 it was exactly that way after initial install but the problem vanished after the initial apt update.I’ve been hoping for the same with this beta but nothing has changed after updates so far. Worked for me. I can decrypt my drive using my logitech wireless keyboard now. Perhaps the module isn’t included in the kernel now??????? If so, it’s a big mistake. Apologies, bit late to the party. Marco – window expands to full screen when moved to top, does nothing at the bottom, works as expected at the sides. In comparison, Compiz functions as expected, window expands to fill half the screen when moved to top, bottom and sides. “Control Centre” -> “Window Preferences” “Enable software compositing window manager” no longer functional after newly added compositing options, is this setting now obsolete, and could be removed? Overall, very impressed with both Cinnamon and MATE beta versions. Thank for all your hard work! I can’t wait for the final release – when is Linux Mint 17.3 going to be released publicly? I also make a suggestion is anyone interested, make presets for all the nice settings at a time. This way if I’m using a ThinClient it’ll at least play video over LAN, and when that’s done, change it back to screensaver-centric. THANKS VERY MUCH! downloaded mate 17.3 (32 bit) on an older dell laptop that has worked fine with previous mint editions. my network connection is verizon fios with a 16 character password (wep2). there is a 15 character limitation on the password input field which i have not encountered before. is this a bug or a setting i can change elsewhere? Finally found the righ distro for my wife =) =) I migrated myself in advance first and will carry on with the main PC in next couple of weeks. Will keep posting bugs/problems too here. THANK YOU for the great work. PD: Is there a way to implement separate wallpapers in every desktop as XFCE does ?? I have been using the live cd of the beta / RC for over a week now, and I am extremely impressed. When this goes live, could you indicate if it is the same disk image or not? Silly to download it again if there has been no change, silly not to if there have been updates. Thank you Clem and team, job well done. I’m getting a 404 for both the “What’s New” and “Release notes” links for both MATE and Cinnamon. Unfortunately not having my own INet access any more, my options to poke around for possible workarounds or upstrem bug reports are extremely limited for the time being. My rather frustrating findings about the reported CPU load issues are empirically based on two boxes with an Asus, respectively DFI nForce2 Ultra 400 mobo (AGP Radeon R420, RV350) and partially an Athlon XP-M based Compaq laptop with IGP320M (RS100) and ALi M1535+, ALi M5229 chipset, using 32-bit LM Mint Gmome/Mate Live ISOs from LM10 to LM17.3, recent XUbuntu/Ubuntu Mate release and Alpha/Beta-Images, that I happened to still have aound. Fedora 22 & 23 Mate i686 also boot fine with ‘radeon.modeset=0’, however, just as with XUbuntu 14.04.3 Beta, Parole fails to play H264 mp4’s or avi’s with the message: “GStreamer backend error. Could not initialise Xv out”, whatever that means, while Debian Live-8.2.1-Mate 32bit simplistically comes with no media player at all. However, with those releases, except Debian, requiring the ‘modeset’ parameter, which in turn causes here the 100% CPU load, I seriously doubt that even a functioning Parole would be useful anyway, given the current circumstances. Debian-Live 8.2.1 Mate surprisingly doesn’t need any modeset statement and the portable-app VLC 1.1.12 plays just fine with a normal CPU load (Pics: http://imgur.com/a/8VaJa). But Debian seems to still load two competing drivers for my Ralink RT2870/RT3072 USB WiFi adapters, similar to what the situation was with Ubuntu/Mint back in 2010/11. However I cannot manage to unload either one of them with the usual “sudo modprobe -r “, which causes a 85% CPU load due to related daemons acting crazy, when either USB WiFi adapter is plugged in (Pic: http://imgur.com/7QFsDr7). The much appreciated Character Map was part of Mint up to LM14 Nadia, but is now dearly missing since 2013’s LM15 Olivia. Please bring it back. And Pluma urgently could use a binary file mode, so that some files, that end up with garbage stuck to their end from filesystem issues, can also be loaded and fixed. I saw that bug which my Mint have is reported at 37 point. Many users affect these problem, there is so much discussion on Linux Mint forum, Launchpad.net, Internet… Please inform me when you will fix this and will it be resolved by automatic update (level 1 or 2)? Should I do something to speed up resolving?